Straddling the line between terrible and O.K. is never somewhere anyone wants to be, but that’s exactly the space Death Squared occupies. It has some decent voice-over work and introduces some interesting concepts throughout, but never manages to capture that Co-op magic that’s been all-but absent from this generation of gaming. SMG Studios has created a few games that really have that “one more run” feel to them. Death Squared, unfortunately, does not. Nothing it presents pulls the game out of being frustrating for all the wrong reasons, or stops it from just being outright boring at times. 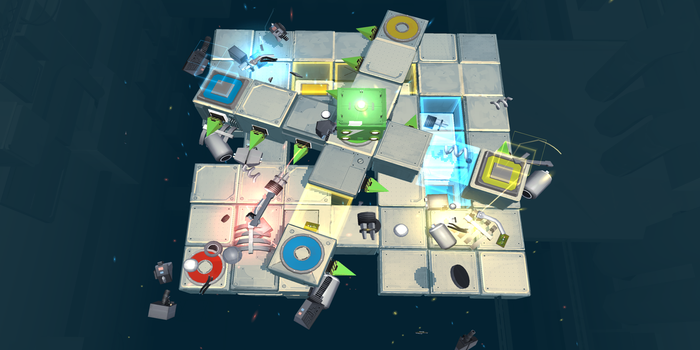 Death Squared’s campaign consists of 80 levels ranging from relatively simple to throw-your-controller-at-the-screen hard. The entire campaign can be played co-op with 2 players if you think you can stomach screaming at the person sitting next to you for that long. There’s also a party mode that allows 2 or 4 Players to run through 40 unique levels and a “vault” of 30 or so other extremely difficult puzzles with more to come as free DLC post-launch. Playing with 4 people very quickly devolves from simple discussions about what to do and who does it, to yelling at whoever messes up. It doesn’t really hit that co-op itch that a game like Portal 2 nails. It’s not slick or modern. It’s not unique or forward thinking. It all just feels incredibly generic. Most levels have you moving on a very tight set of tiles that require a kind of precision that isn’t at all present in the controls. Falling off the stage and walking into things you don’t want to walk into are all part of the package in Death Squared. Sure, there is some trial and error in any game like this, but here we move past trial and error. There were many times where my fellow robots and I had figured out a solution to a puzzle and would time and time again fail because of how loose the controls were when accuracy was necessary. Playing alone is even more of a trial of patience. There is no indicator as to which control stick controls which robot. Often the corresponding robot will spawn on the opposite side of its given control stick. The number of times I died on a level just because of this was embarrassingly frustrating. It’s just bad design. 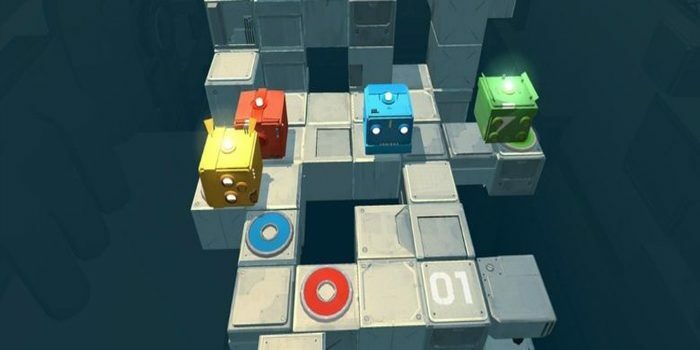 There is a difference between forcing the player into a trial and error scenario and killing them nonsensically, and Death Squared seemingly treads that line. I can’t say I had much satisfaction out of beating any given level. My only reward was being brought to the next stage hoping maybe between this stage and the next was a bit of dialogue between a programmer and an AI explaining why I was even trying to figure these puzzles out at all. What little charm the game does have comes sparsely through these little bits. I found myself chuckling every once and awhile. It leans pretty heavily on some Human/AI tropes that we’ve all grown to know over the past decade or so, but it does an admirable job of at least trying to make up for the lack of identity permeating throughout the rest of the game. At the end of the day, Death Squared really doesn’t present anything unique. Its touchy controls work against the precise nature of the game. Though the sparse amounts of dialog in the game gave me a few chuckles, it never breaks out of its box. It’s just a worse version of the same jokes we’ve heard before. It’s a shame because SMG studios has put out some really great mobile games but what they have here is altogether unremarkable. Death Squared is Lame Cubed. The Smart Marks 191 – Great Balls of Fire Recap!